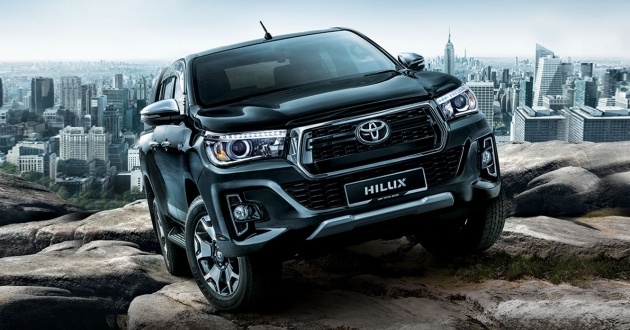 UMW Toyota Motor has introduced the new Toyota Hilux L-Edition (‘L’ refers to luxury), which is based on the facelifted pick-up truck we sighted recently in Malaysia. The L-Edition is available in 2.4L AT 4×4 and 2.8L AT 4×4 guises, where the former is priced at RM119,300 (OTR without insurance) and the latter at RM133,900. As you can see, the Hilux L-Edition sports a nose that resembles that of the Tacoma with a large hexagonal grille. There’s also a redesigned bumper, one which features an upturned centre air intake and new fog light enclosures. Beyond these, the rest of the exterior appears similar to before, like the interior. The L-Edition comes with a number of model-specific elements, like two-tone 18-inch five-spoke alloy wheels (with 265/65 profile tyres) plus a chrome and black finish for the front grille on the exterior. Moving inside, you’ll find piano black trim instead of silver ones found in the standard 2.8L AT 4×4 and 2.4L AT 4×4 variants. Additionally, the seats are upholstered with perforated leather instead. Aside from the facelifted look and L-Edition items, the new trucks are largely similar to the 2.8L AT 4×4 and 2.4L AT 4×4 variants of the pre-facelift Hilux. The 2.4L L-Edition gets halogen headlamps (with bulb-type DRLs), whereas they are LED units on the 2.8L model. Interior equipment on the 2.4L L-Edition includes a manual air-conditioning system, multi-info instrument cluster display, smart entry and start, regular head unit, eight-way powered driver seat, seven airbags, Vehicle Stability Control (VSC), reverse sensor and ABS with EBD plus brake assist. The 2.8L L-Edition see the addition of automatic climate control (with rear vents), a 4.2-inch Optitron multi-info display, 6.1-inch touchscreen multimedia unit, cruise control, digital video recorder and Downhill Assist Control (DAC). No changes under the hood, with the 2.4 litre 2GD-FTV (150 PS, 400 Nm) and 2.8 litre 1GD-FTV (177 PS, 450 Nm) turbodiesels continuing their service alongside a six-speed automatic transmission. Both L-Edition models also come with Active Traction Control (A-TRC) and a four-wheel drive system with on-the-fly switching and a rear differential lock. Colour options for L-Edition models are identical to all pre-facelift variants (Solid White is only for the single-cab 2.4 MT 4×4), and the warranty is for five-years or 150,000 km, whichever comes first. It is likely the rest of Hilux range will be facelifted as well, but for now, we’ve been told the L-Edition models are the only ones with the new look. Interested? 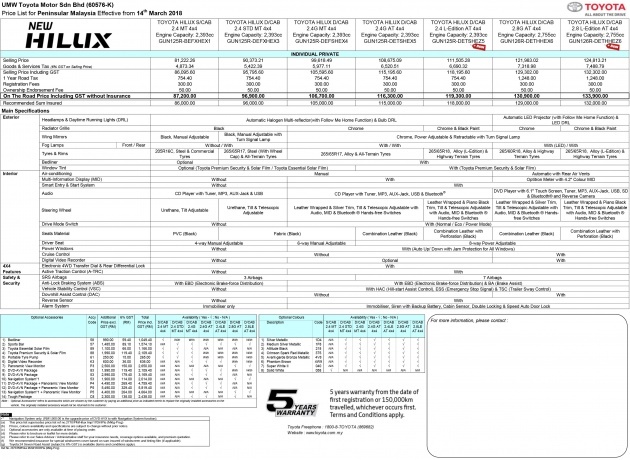 Check out CarBase.my for detailed specifications of the new Toyota Hilux. UMW: Instead of launching the new facelift model across the range, why not we give it a fancy name and con more ppl’s money? Facelift? What facelift?! Looks more like just a front bumper change and a bad excuse to increase prices. Then greedy fellows like UMW, under the pretext of giving spec like VSC and 7 airbags, increase prices slowly by slowly. @rajoo, 7 airbag and VSC are not standard Hilux features 15 years ago at least in Malaysia. It is only recently Hilux has these 2 safety features in Malaysia. For your info, Navara top specs and Ranger 2.2 top specs only come with 2 airbags. The meter cluster looks crap. With white background seriously? 130k for a luxury pick up trucks..? What is the propose to purchase a pick up truck? For luxury? Your smartphones are also made in China. Soon, we will have bullet train made in China as well. When you compare the looks, price and specs of the pre-facelift 2.8 and facelift 2.8, my conclusion is you are better off with the pre-facelift and just change the tyres to the 265/65/R18 size when due for replacement. Its just a grille+bumper+foglight change, all of which can be done yourself in the years down the road. The facelift’s new wheel design is damn ugly, previous design is better. Great! But it is just another truck with plastic facaded , leather seats, rubbish e-4wd, truck Ah Beng thrilling, a frail truck+SUV wanabe with an iconic nameplate plastered on it by the marketing department with the price that does not say it is a utility truck. period. liked the engines tho. Vigo was like ‘wtf’ at first but ‘okay’ when Revo appeared. Granted, it has to keep up with the times but come on…the bumpers weren’t supposed to fall off without crashing it. I thought the current Hilux safety specs are superb. Both the 2.4 and 2.8 variants top specs have 7-airbags and VSC. For your info, Navara VL top specs and Ranger 2.2 XLT top specs only have 2-Airbags. I sey man, I just ordered one. Anyone having reflection problems on the chrome trim across the dashboard on the L Edition version? It’s reflecting its image on the doors’ windows and the sun into the driver’s eyes, very dangerous situation?